The Anti-Thesis - Riding Forcefully Up? Lowering of the front end by riding deep. Another problem concerning deep training is that the horse puts more and more weight over his forelegs the more the head is lowered. This is the same for all kinds of lowering of the head from grazing, over the classical forward-down-out to the controversial deep. The horse can manage to counteract this by using the hindlegs in a way common for deep ridden horses - they reach the hindlegs far in under the body in hope of alleviating the front of some weight and regaining balance. But the legs are stretched out and all angles of the joints in the hindlegs are straight. The straight legs cannot manage to balance and carry/push the weight in a dynamic and athletic way, so instead the horse slants the forelegs back and starts to rock back and forth from rear to front. To reach as far as possible, he pulls the belly in, arches the back and rotates the pelvis but not with a swinging back, but with a statically arched back. The horse shortens the underline by tensing the abdominals and the underline muscles of the neck, and breathing becomes tense. 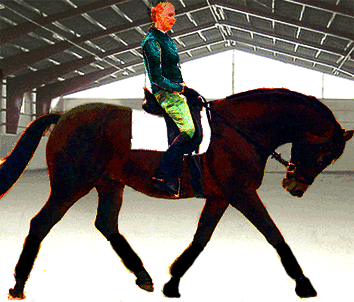 The blocking of the back affects the rhythm of the gaits, and can lead to impure gaits. 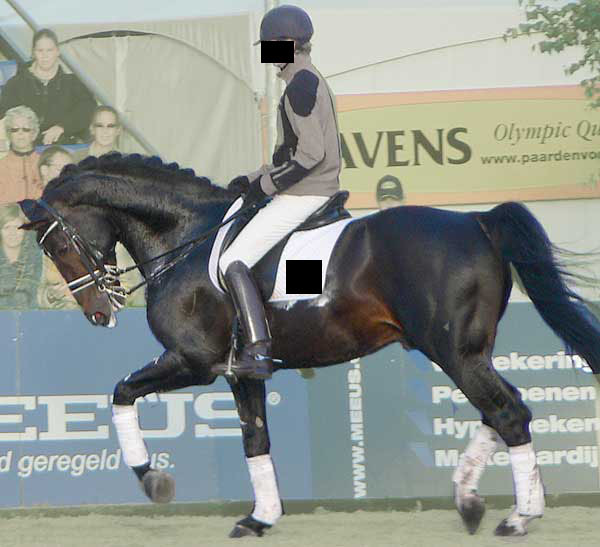 At the canter, as seen here to the left, the horse cannot use his hindlegs and back to lift the forehand, to come into the moment of suspension of the canter. The forehand is grounded, and stays so until the hindlegs have touched down and the horse rocks back over the straight hindlegs to be able to move the frontlegs forward. The moment of suspension is gone. 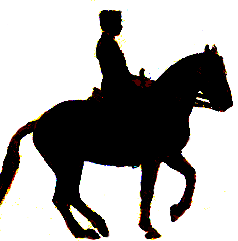 At the trot, the blocking of transmission through the back makes the front end of the horse trot at a different beat from the hindhand. The hindleg lands, sometimes quite a lot, before the diagonal fore. This phenomenon is called DAP, Diagonal Advanced Placement. * One is that the hindleg also is quicker to lift off than the fore, so that when the push-off is at hand, only the foreleg supports the weight. * Number two is that as the hindleg lands prematurely, and bends and moves back with the ground while the mass of the horse's weight is still in the air, the horse evades taking weight on that leg. It is already placed well back when the forehand and the main mass of the horse comes down. Usually it is behind the point of the hip, and hardly supports any more weight than it would if it had landed in synchrony whith its diagonal fore. As the horse glides forward, supported by the diagonal legs, the hindleg is placed rather well back, much longer back than in a horse not trained to land "in advance" behind. At the canter, the trunk of the horse rocks like a rocking horse. This is because of the nature of the canter gait. The canter has "natural DAP" in that that the horse moves forward with all 4 legs supporting/pushing in each synchronized leap, but one hindleg touches down first (then a diagonal, then the last fore). The rocking/rolling of the canter. The rocking of the body is a natural effect of the (more or less) simultaneous pushing forward of the legs, the rolling leap, and in the moment of suspension, helps the horse to lift the forehand and land with the hindlegs well under for the next leap. But at the trot, this is not a very effective way to move, since the movement only originates from half the body - one diagonal. To roll the trunk at the trot only uses up extra energy, energy that could be spent wiser. When pushing off at the trot, the hindleg of the diagonal is doing most of the work. The foreleg supports the load in front and lets the body glide over its support (1). This necessitates that the hindleg must push the whole body forwards, and not only push the quarters upwards while the forehand is grounded. If the hindleg pushes the quarters up and leaves the forehand (2), the hoof of the hindleg will take off long before the front hoof will be able to lighten. If this happens, the frontleg must by itself push the forehand upwards, which it is not very good at. Usually the horse learns to bounce on the tendons of the stay apparatus in order to get the front up. This is a very inefficient way of propulsion for a horse. 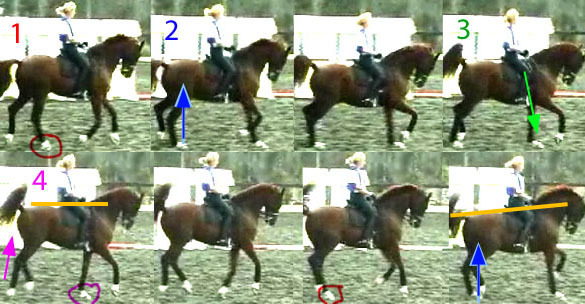 (3) shows the normal, non-DAP landing of a horse whose body does not rock and (4) shows the notorious DAP. DAP makes the body of the horse rock with the leaps. Lots of energy is wasted pushing one end of the body up while the other is down. It is deceiving, though, since the rocking makes the trot or passage look big, and the horse seems athletic since he works so hard. In reality, it can be very strenuous on the frontlegs of the horse, since they take the full force of the front end slamming down. And as we all know, the frontlegs are straight, so the shock absorbing qualities of the forelegs aren't optimal. Stills from a video sequence of a horse ridden deep. Note de-synchronisation and rocking of the trunk at trot/passage. The mechanism of bending the back up by riding deep. The misunderstanding that collection is "getting the back up" is one of the most prevailing ones of modern times. In a horse magazine in England one could a couple of years ago read a series of articles where Dr Gail Williams Ba(hons)PhD "exploded the classical myth" that horses transferred a proportion of their bodyweight over the hindlegs in collection. Instead, she explained, it was the rounding of the back, the tensing of the bow, that made the rider feel as though "floating on air". "I have no doubt most of you have been taught that, when the horse is working on the bit, he is re-balancing himself to take more weight on his hindquarters. This is not correct." " What you feel when the horse works correctly is what I have described above. It is not the weight that the horse is transferring onto the hindfeet, it is merely the increased time that the hindfeet spend on the ground that accounts for the impulsion that you feel." What she described above was how the abs pull the pelvis forward in collection to "place his hindfoot further underneath him and therefore increase the amount of propulsive force because he can increase his hindlimb stance-time." To complete the bow and string (or ring of muscles theory) she calls on the small scalenus muscle , to pull the ribcage in the other way and flex the joint between the first chest / last neck vertebra downwards. This, would then create tension in the nuchal ligament to pull the thoracic processes forward. As a last finishing touch "the flexion at the poll is created by the contraction of the long muscles of the head and neck." These remarks makes me wonder how far she herself has gotten in her education as a rider, opposed to her education on paper. The swinging back, "floating-on-air" feeling is merely the beginning of collection. It comes from the fact that the horse has engaged his hip benders and is using his topline neck muscles right to lift the back under the saddle by arching forward. It is not collection as in piaffe, canter pirouette or even collected trot. In true collection, that begins with the collected movements of 4th Level and beyond, the more the hindlegs step under to support the weight, the more collected the horse. The engagement of the hips and lifting of the back should by then be second nature to the horse, and he should always work in such a way. Added to that will be the stepping unde and bending of the hindlegs. Or has anyone perhaps seen a horse 'arch the back up' into levade? Philippe Karl and Raid II illustrating collected piaffe. One must start at the beginning and remember cause and effect. In real collection the hindlegs step further in under the body and the pelvis rotates. All joints of the hindlegs bend and more weight is loaded onto the hindhand. As the quarters/back mucles try to lift the forehand, like a crane if you will, the back arches. Thus the very round backs of horses in correct piaffe. The rounded back is a result of collection, not collection in itself, just as the elevated neck position is the result of elevation of the forehand, and not collection in itself. But just like riders crank up the head and neck into an awkward position and call it collection, they try to crank up the back and call that collection, too. Bending the back up by setting the head deep does not alleviate any weight from the forehand. On the contrary, the lowered head weighs the forehand even more. The horse learns to arch his back emanating from the neck position. And when the head and neck is brought back up, the back goes down again. Back to square 1. Deep ridden horses are no rounder in the competition arena than those trained non-deep. Some horses try their best to keep the back up, and do what they can. They dive down with head and neck trying to get the back up. Or curl the neck around to pull on the nuchal ligament. So these horses, not trained to real collection, but just to arch the back when the head is down, have what one would call a horizontal balance. They are not trained to carry any extra weight over their hindfeet in any of the collected movements. Especially evident is this in the piaffes of these horses. One does not see the hindlegs stepping under, nor any lowering of the croup, simply because they are not collected. They have learned to do anything out of balance and collection (at best in horizontal balance), and a little piaffe without lightness of the forehand is no problem. Just shake a leg and trot on the spot. "In a standing horse the front limbs carry about 55% of the horses weight, the hindlimbs about 45%. In many top dressage horses, the weight does not shift significantly from the front to the hindlimbs as the horse becomes more collected. However, a few horses do show a marked weight shift, and these seem to be the horses that are particularly well balanced. Therefore, balance may indeed be related to the horses ability to carry more weight on the hindquarters, but the absence of this ability does not preclude a horse from competing successfully at the highest levels of competition." I think that says a whole lot about modern competitive dressage, and not a whole lot about collection in general, except that the best balanced horses, were those who did collect the old-fashioned way. I wonder why? When the horse has been trained to do piaffe in a horizontal balance, the transition in and out of the piaffe flow fairly smoothly, since the piaffe is no more collected than the passage/trot before or after it. Riding and training the horse deep at different difficult bends and transitions has taught the horse to keep moving those legs to the rhythm, be it on the spot or forwards. A front-heavy piaffe without collection. The horse has not been trained to shift more weight rearward in the piaffe, and then to shift it forward when trotting off again. So there's no weight shift. A transition between a collected piaffe on the spot and a collected passage is a lot more difficult. The horse needs to go from having used his power for both taking weight behind and supporting it behind, to both supporting it and propelling it forward. They need to learn to shift the weight seamlessly over the hindquarters and then back again, without losing rhythm. The saying that a smooth transition between piaffe and passage is the proof of true collection is simply not true. However, the beauty of a smooth collected transition far outweighs the non-collected. There's a very common form of horizontal balance, the problem of triangulation. In this kind of piaffe, the hindlegs do step under, some. But just as much as they step under, the forelegs step back to take their part of the bodyweight. This slanting back of the forelegs becomes second nature to a horse trained deep. The artificially rounded back makes the chest stoop down, and the attachment of the shoulder is slanted back. In order to bring the forelegs forward, the horse needs the use of the brachiocephalicus muscle, attaching at the humerus and the skull. When the head is low, the upper attachment slacks the muscle and the leg leans backwards. The serratus cervicis attaching at the shoulderblade and the base of the neck literally pulls the shoulder forwards forcing the leg back. Also, since the hindlegs are not prepared for carrying a lot of weight in this collected movement, the forelegs need to move back to help. This is very commonly seen, and often commented on as "Look how gathered the horse is!" pointing at the hindhooves proximity to the front hooves. They have managed to learn the fact that the horse should stand over less ground, but missed the fact that this should only come from the hindlegs stepping under closer to the frontlegs, and that the frontlegs should remain vertical. At the Spanish Riding School and the Cadre Noir, triangulation is a well known evasion from collection. They know this because they train piaffe as a preparation for the levade, not for piaffe. In order for the horse to be able to transfer all his weight back over his hindlegs, a great proportion of it needs to already be loaded there. If not, the horse would have to jerk the head and neck up to a rear before coming down into the levade. These horses are taught to piaffe with more and more of their body mass supported over the well bent hocks, until they can just bend the frontlegs and lift them up into come into the levade. Phillippe Karl and Odin at levade. "It is wrong. There is no substitute for what is right. Nowadays new-born trainers teach and built winning competitions without having ever felt a true self-carriage throughout all the movements, with sound basis. If you put the head of the horse in that position, you lift and block the back up. This is not the feel we want. People think it is but is is not. They do not know. They have not felt it within themselves. How can they train and teach? They have techniques, they make things happen. But they do not know it." Now, the overbent looseness of these necks are not to be compared to the cramped firmness of the necks of horses ridden forcefully up. Rollkured horses are ridden with gentle aids in the competition arena, and overbending in the neck does not come from resistance at all. Simply from lack of tone. The odd neck shape in horses ridden forcefully up can be about the same. The same thing actually happens to the S-curve of the spine. When you ride a horse forcefully up, the neck curls in just the same way. Indeed, it is even worse, since the back is pushed down by the high artificial erection of the neck and the force the rider has on the reins. The pull on the reins is pushed into the back of the horse since the rider pulls against her seat or stirrups. The horse needs to use the underline of his neck to fight the riders pull. If he didn't the rider would pull the neck up until the horse can no longer move forward. And he knows, that if he slows down, he will only be kicked on into a wall of hands, anyway. Many horses actually carry the weight of their riders upper bodies with their mouths. Their entire bodies need to be in constant tension to stop the rider from pulling himself and the horse's back down beyond where the horse can still move forward. The head, neck AND withers are supposed to elevate as the hindquarters lower. The lowering of the hindquarters make the whole forehand both seem more elevated in relation to the hindquarters, but that's not all. The lightening of the forehand actually makes the withers taller. The trunk of the horse rests in a sling of muscles between the frontlegs, and as the weight lessens, the muscles and tendons are not weighed down so much. The pastern is also straightened, and the forehand is really higher. Having the horse just raise his head to "show himself in full glory" has no purpose other than to meet one criteria of the rules of the FEI - the poll as the highest point. If you instead ride for collection from behind, the poll will naturally become the highest point, as a result from collection, elevation and arching. But in horses trained deep, this can be difficult. Often we see horses with erected necks, sometimes even forcefully erected necks, and the head is still behind the vertical like the neck had no skeleton. These horses are so used to being brought down/in and behind the vertical, that they have no idea that they should do something different in the arena. They have become acustomed to answering the rein aids with pulling their heads back towards the neck/jowl. The rein aid cannot mean, "lift the base of the neck" or "bend the grounded hindleg" because in training it always means "curl the neck and go forward regardless of balance". These horses can also get bulky underline muscles that really hold the head behind the vertical automatically as soon as someone holds the reins. Pressure on the tongue has been conditioned to mean "pull the nose in" just like Pavlov's dogs. If correctly ridden horses have the reflex to "relax the poll" as soom as they feel the action of the bit across the tongue, these horses are conditioned the very same way, only that they answer with tension, pulling the chin in.